No worries, it is only a magnetic mouse. 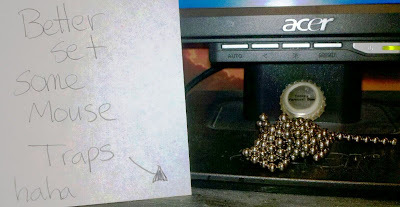 I came into the weather center last week and there were about 70 small magnetic bearings next to the monitor. So each day it is exciting to see what the previous meteorologist has made out of the magnets. I have to give the gold medal to Chris Mulcahy. 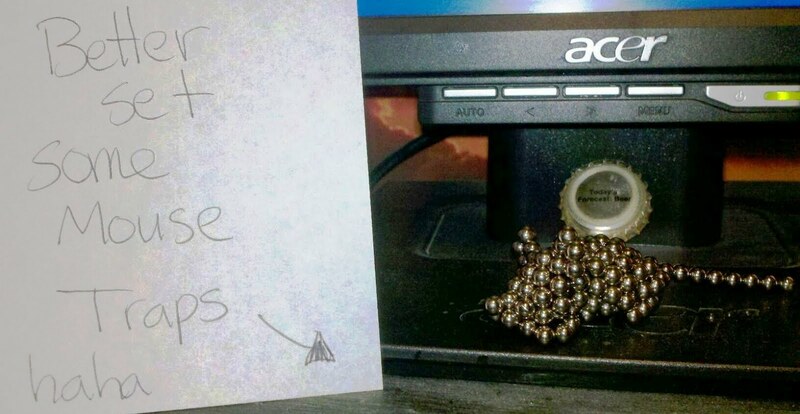 He managed to arrange the magnets into the shape of a mouse. Normally Jeff Booth and I make geometric shapes, but never have we tried animals... props Chris! It was a bit of a gloomy weekend so Dawn and I decided to travel out to the Air Force Museum and we had quite a lot of fun. I went when I was in high school, but there have been quite a lot added since I was there. We were only there for a couple hours, but you could easily spend days at the museum if you wanted to digest everything. When we were leaving we played the license plate game in the parking lot.... 26 states and one more from Ontario. Big draw from many states and it is cool that we have that it, right here in Dayton. Break out the blankets once again... not only for the bed, but for the plants. We will have a cool day today with highs in the mid 50's and plenty of sunshine. Tonight we will drop to a low of 32 so there is a Freeze Warning. This normally is a pretty big deal to cover the plants, but ESPECIALLY for this year since so many of the plants are further along compared to normal with the record breaking warmth we have seen. The best way to cover plants is a blanket or sheet to trap in some of the warmth from the ground. If you want to upgrade that a step further then add a sheet of plastic on top of the fabric. NEVER use plastic alone because it may cause more damage than no cover at all. Remove the covers after daybreak so the plants can breathe and get back to work with photosynthesis. If you do have potted plants then bring them inside overnight, but don't forget to put them back outside. We will warm up quickly tomorrow with sunshine early and a high of 61. Clouds will move in later with a chance for rain early Wednesday as a cold front pushes through, but it looks to be scattered rain as it moves into the area. The cool air will not be here really until Thursday, so Wednesday will be warm with a high of 71, but then 57 on Thursday. Plenty of sunshine for the end of the week as we warm back into the mid 60's, so really not a bad week overall. Make sure to cover those plants tonight and have a good one!